Did you know that macular degeneration is a leading cause of blindness in people over 60? Age-related macular degeneration (AMD or ARMD) is a disease that gradually causes loss of central vision. Risk factors for macular degeneration include smoking, obesity, sedentary lifestyle, family history, race, and age. 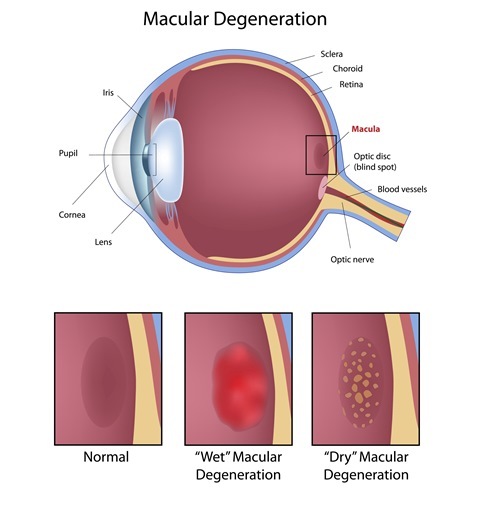 There are 2 forms of macular degeneration: Wet and Dry AMD. Wet AMD occurs when abnormal blood vessels behind the retina start to grow under the macula (the central retina). These new blood vessels tend to be very fragile and often leak, causing rapid loss of vision. In early wet AMD, straight lines and edges may appear wavy. If this occurs, you should see a retinal specialist for further evaluation and treatment as soon as possible. Dry AMD occurs when light-sensitive cells in the macula slowly break down, gradually blurring central vision. You may notice that it is difficult to see fine details, or you may need a lot more light to read or do other daily tasks. Therefore, it is very important to have a comprehensive retinal exam periodically. This is because up to 20% of dry AMD can change to wet AMD, the latter often requiring treatment immediately. There are two major Diagnostic Tests for AMD: Fluorescein Angiography and Optical Coherence Tomography. Most people with AMD are seen at least twice a year, and if being treated, could be seen every 4-5 weeks. Dry AMD: There is no specific treatment for dry AMD, but there are antioxidant vitamin supplements that can be taken to slow the progression. It is recommended that you see a retinal specialist so they can check your retina and macula, and recommend the appropriate antioxidant vitamin supplements. The National Eye Institutes Age-Related Eye Disease study (AREDS) found that taking a specific, high-dose formulation of antioxidants and zinc significantly reduces the risk of advanced AMD and its associated vision loss by up to 25-30%. Wet AMD: The change from dry to wet AMD can occur very quickly, often robbing a person of their central vision. There are 3 main layers of tissue in the back part of the eye: starting from the inside of the eye and going towards the back, they are the retina, which contains the light-sensing cells; the choroid, which contains the blood vessels that abnormally grow in wet AMD; and the sclera, which is the white wall of the eye. The macula is the central area of the retina which provides the most detailed vision. If leaking or oozing of the abnormal blood vessels occurs in the macula and is not treated appropriately and quickly, scarring in the macula can occur, resulting in irreversible loss of vision. Treatments mainly consist of intraocular injections of medicine, which is highly effective, and sometimes lasers treatment. The treatments target the abnormal blood vessels in the macula to stop the leakage and restore vision. The injection treatments work about 90% of the time to stabilize or improve vision. In our offices, we provide state-of-the-art testing and have the latest treatment options that can be performed immediately. An early treatment of wet AMD improves the chance of visual recovery.